Triad Modern Quilt Guild: Happy New Year! It's a new year for our guild. We hope you are ready to dig your sewing machine out from under the gift wrap paper for another great year of designing, piecing, and quilting. The TMQG Board had a meeting to plan this year. Our goals are 1) to provide educational opportunities to our members, and 2) to provide lap quilts, toiletry items, and other sundries to Forsyth Co. Senior Services and the elderly members of our community. Our meeting focused on ways to accomplish those goals. We are also planning on 3 sew-ins for the year in March, June, and September. We will be scheduling these for the Friday evenings after the Tuesday meetings. More information for the calendar to come as we receive confirmation from our invited guests. Swaps are being planned, both internal and external. For the annual raffle, we are planning on making 2 throw sized quilts. We will be asking each member to sell $40 worth of tickets. Raffle proceeds are used to invite quilting educators from across the country and to pay their speakers fee and travel costs. Remember Senior Services - While shopping this MLK holiday, consider picking up a package of adult sized diapers to donate. Please welcome our own Lee Monroe. She will be presenting "Understanding the Rainbow", a discussion of color theory. South Fork Community Center follows the plans of Forsyth Technical Community College. If FTCC is closed in the evening, then the Community Center will be closed, too. Thanks for leaving a comment. We love our readers! Welcome to the online home of the Triad Modern Quilt Guild. We are a branch of The Modern Quilt Guild and are excited to join together modern quilters in the Winston-Salem, Greensboro, and High Point area of North Carolina. We meet every fourth Tuesday of the month at 6:30 pm at South Fork Community Center Meeting Room in Winston-Salem. Visitors are always welcome and everyone is encouraged to bring finished or ongoing projects for show-and-tell. Please drop us a note if you have any questions, comments or suggestions. We would love to hear from you! 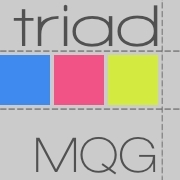 Look who loves the Triad MQG!